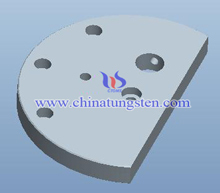 Tungsten Alloy Radiation Shield is a best choice for radiation shielding applications, which could be used in both medical fields and industrial areas. Compared to traditional radiation shielding materials, such as lead, it provides excellent properties. High-density alloy can provide the same energy absorption as lead using 1/3 less material. People are taking advantage of tungsten alloy's reliable radiation shielding properties. HA170 is the most ductile and readily machinable grade. Common application areas include counterbalancing weights for the aviation and aerospace industries, crankshaft and auto racing car, bucking bars for rivet setting, and radiation shielding. HA175 is commonly used to produce chatter-resistant boring bars and tool shanks as well as radiation shielding components. HA180 is often applied where size is a factor in the placement of balance or ballast weights. It should be typically of parts with small volume but heavy density. Other applications include radiation shields and collimators of x-ray or gamma ray beams. The densest of the Ni-Fe binder alloys with tungsten, and is the preferred grade for radiation shielding in the medical imaging industry. Adding copper as a substitute for iron in the binder phase, as there is requirement for nonmagnetic working environment and ideal choice for radiation shielding closing to a magnetic field. Much denser than HA170C that used as large shieldings in nonmagnetic working environment needed. Tungsten shileding is used in research activities as collimators (devices which guide or focus beams of radiation) or containers for radioactive isotopes.Nuclear research use nuclear reactors or cyclotrons to study or create radioactive materials. Tungsten alloy radiation shielding is ideal for radiation protection for both X-ray and Gamma-ray. High density of it is more than 60% denser than lead, which allows a reduction in the physical size of shielding components. NDT methods may rely upon use of electromagnetic radiation, sound, and inherent properties of materials to examine samples, which includes some kinds of microscopy to examine external surfaces in detail. Although sample preparation techniques for metallography, optical microscopy and electron microscopy are generally destructive as the surfaces must be made smooth through polishing or the sample must be electron transparent in thickness. The inside of a sample can be examined with penetrating electromagnetic radiation, such as X-rays or 3D X-rays for volumetric inspection.Tungsten alloy radiation shielding could be used for radiation protection from the harm radiation. Geologging is an exploration technique used mainly in the oil and gas industries. It is also known as wireline logging and borehole logging. A gamma ray source is lowered into a borehole and the radiation penetrates the rock strata. This data can then be analysed to determine whether deposits of gas or oil are present. Tungsten alloy is used to shield the radioactive source and to act as a collimator for the gamma beam. Radiation is used to inspect welds and to detect cracks in pipelines. A gamma source is mounted on a remote-controlled wheeled trolley (sometimes called a "pig") and travels inside the length of the pipe. A tungsten collimator is used to direct the radiation onto the target, whilst the radioactive source is housed inside tungsten shielding. d: Shielding thickness, with the half-value layer thickness of their units, you need to half-value layer thickness of the quality of translation into the thickness of the material, divided by the density of the material can be obtained. In this way, tungsten alloy radiation shielding could be much thinner to have the same protection ability compared with other material such as lead or Al2O3.